A rabbi, a minister, and an imam walk into a bar. No, really. Since 9/11, three religious leaders in Seattle have been meeting for sometimes “vigorous” discussions, lecturing together, and even doing joint spiritual teaching. Rabbi Ted Falcon is founder of Bet Alef Meditative Synagogue, Reverend Don Mackenzie is minister and head of staff at the University Congregational United Church of Christ, and Jamal Rahman is a Muslim Sufi minister at the Interfaith Community Church. And that time they walked into a bar? It was to discuss a book they co-authored, Getting to the Heart of Interfaith: The Eye-opening, Hope-filled Friendship of a Pastor, a Rabbi and a Sheikh. The three are now known as the Interfaith Amigos. Sarah van Gelder: How did the three of you start working together? Rabbi Ted Falcon: When 9/11 occurred, I called Jamal, and the two of us did a Shabbat service together. Since then, we’ve taken part in each other’s services, and it has become natural to work together. When one awakens spiritually, there is an awakening to inclusivity. You start to perceive that each authentic spiritual path is an avenue to a shared universal. To deepen means to explore that territory together along with the ethic that naturally flows from it. Sarah: Had you done those exchanges before 9/11? Brother Jamal Rahman: Not much. After 9/11, as a Muslim, I felt a strong need for such a community. Ted: A lot of attention at that time was focused on the perpetrators of 9/11 as representative of Islam, and we wanted to counteract that. We needed to put public faces on mutual understanding between our faiths. When an imam in Nigeria saw hundreds of desperate, frightened families running into his village last Saturday, he decided to risk his life to save theirs. They were fleeing from a neighbouring village – a mainly Christian community. 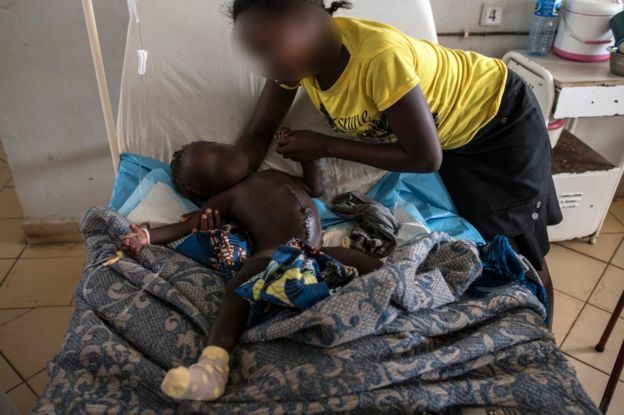 They say they came under attack at about 15:00 (14:00 GMT) from about 300 well-armed men – suspected cattle herders, who are mostly Muslims – who started shooting sporadically and burning down their homes. Some of those who managed to escape ran towards the mainly Muslim neighbourhood nearby where the imam lived, arriving over the next hour. The cleric immediately came to their aid, hiding in total 262 men, women and children in his home and mosque. “I first took the women to my personal house to hide them. Then I took the men to the mosque,” the imam told BBC Pidgin. We have blurred the faces of the imam and the villages, for their own safety. Background: He was born and raised in Ghana’s capital city, Accra. He graduated from the Say Islamic University in Niger and came to the United States in 1998 to study at the Graduate School of Islamic and Social Sciences in Leesburg, Va., where he received a master’s degree Islamic law with a concentration in marital affairs in a joint program with Howard University. He is the imam of the Islamic Center of the Capital District in Colonie and a chaplain at Washington County Correctional Facility in Comstock. He and his wife, Khadijah, live in Clifton Park and are the parents of daughters Ubaidat, a University at Albany graduate now studying for the MCAT medical school entrance exam; Hawwa, a junior at UAlbany; Rahimat, a Shenendehowa High School senior who will attend UAlbany in the fall; and Summayyat, 14; and son Rayyan, 12, who are middle school students in Clifton Park. How did growing up in Ghana shape your world view? My parents were practicing Muslims, and so was I, but in our part of the world, we lived side by side with Christian people and others. They were my friends and neighbors. I went to the Christian Mission Grammar School while, simultaneously, taking classes at a traditional Islamic School. I learned the importance of balancing Islamic theology and other sciences and disciplines. That foundation aided me in my transition from West Africa to the United States both on an intellectual/Islamic level and in understanding the new culture. Amid a vexed political and social climate, three religious leaders in North Texas—a priest, an imam, and a rabbi—proved it’s possible to come together in times of division. The Rev. Dr. Chris Girata, Imam Omar Suleiman, and Rabbi David Stern gathered at Saint Michael and All Angels Church in Dallas last Thursday to discuss where their respective faiths diverge, and where they unite. The panel discussion, presented by the Women of Saint Michael and moderated by the Rev. Amy Heller, drew in people of all backgrounds. The three panelists, who talked like old pals, helped facilitate a light-hearted environment. As religious leaders they have met before on more somber occasions. Suleiman and Stern, for example, both spoke at a vigil at Thanks-Giving Square following the shooting of Dallas police officers in July 2016. It was refreshing to see these men converse candidly, in more relaxed circumstances. The solidarity shown by the priest, imam, and rabbi enlightened and inspired many of the hundreds of people gathered at the church. Sandra Klingeman, who has belonged to an interfaith group for a number of years and attended the discussion, said she has heard the three leaders speak before, and knew they were among the best faces of each of their religions. The tour, involving around 60 imams, will visit the sites of terror attacks by Islamist extremists. Muslim leaders launched a European bus tour in Paris on Saturday to express opposition to terrorism in the name of Islam. Under the banner “Muslims’ march against terrorism,” imams from around Europe and North Africa planned to visit sites of recent terrorist attacks, starting at the Champs Elysees and passing through Germany, Belgium and other parts of France over the next week. “Our message is clear: Islam cannot be associated with these barbarians and these murders,” who kill in the name of Allah, said Hassen Chalghoumi, the imam of Drancy, France, according to Le Figaro. The initiative is the brainchild of Chalghoumi and Marek Halter, a French-Jewish writer and intellectual. The tour will land at the site of an attack on a Christmas market last year in Berlin on Monday, before holding a ceremony in Brussels on Tuesday. It is set to stop in Saint-Etienne-du-Rouvray, France (visiting the grave of a priest who was stabbed), and a Jewish school that was targeted in Toulouse. It will also pass back through Paris and the Bataclan nightclub, according to the Belgian paper La Libre, wrapping up on July 14 in Nice, where French President Emmanuel Macron is expected to participate in an homage to victims on the anniversary of the truck attack on the Promenade des Anglais. Dearborn Heights — Inside a former church on Ford Road is a room that soon will be filled with high-tech equipment to broadcast the message of Islam to the world. The room will be stocked with computers, video cameras and other media equipment to produce online sermons, radio programs and a comprehensive website aimed at reaching Muslims here and around the English-speaking Islamic world. The project is part of the Islamic Institute of America, a new mosque in Dearborn Heights led by Imam Hassan Al-Qazwini — one of Metro Detroit’s most prominent Muslim leaders. Hundreds of people attended the first Friday prayers at the mosque last week. Al-Qazwini, 52, led the region’s most prominent mosque, the Islamic Center of America in Dearborn, until resigning nearly two years ago amid controversy. Now he has ambitious plans for a new community. Among them: monthly interfaith seminars for non-Muslims, a social work outreach to those suffering from problems such as drug addiction and domestic violence, a youth speakers bureau to fulfill growing community requests, a Middle Eastern gift shop and numerous educational programs for youth as well as an arcade in the basement for kids. Also envisioned by Al-Qazwini is the nation’s first seminary to train Shia imams — so American-born Muslims don’t have to leave the U.S. and spend years in the Middle East, like Al-Qazwini did and where his two sons are studying to be Islamic spiritual leaders. 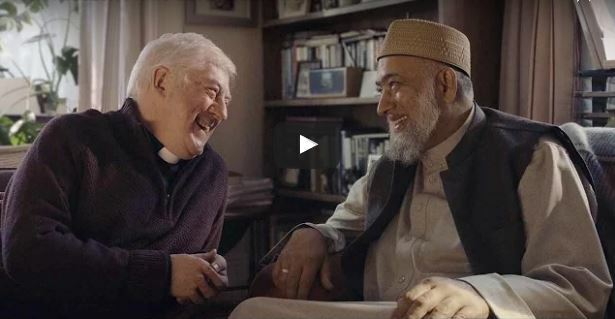 The video shows a real vicar – Rev Gary Bradley from Parish of Little Venice – with an imam played by Zubeir Hassam, the principal of the Muslim School Oadby in Leicester. The pair enjoy a drink together before ordering each other knee pads using Amazon’s service. Bradley told Christian Today the ad had “a very important message, particularly at this time of year”. He said in his parish “we have people of all faiths sharing the area and it is important that we understand and relate to each other”. he two plan to meet regularly after filming together. Bradley said it was a particular pleasure “to consolidate the pastoral and theological concerns which bind us together”. Simon Morris, director of advertising at Amazon, said it was an “authentic and charming story” adding he had consulted the Church of England, the Muslim Council of Britain and the Christian Muslim Forum before filming.